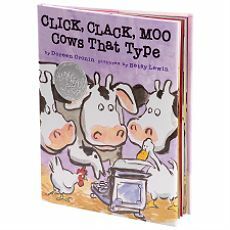 During Feb. 2005 Kohls Cares For Kids Program had Click, Clack, Moo Cows That Type on sale for $5.00. Plus, all proceeds benefited designated local children's hospitals. It is great that Kohl's has this program. You get a great book at a price that you can't beat anywhere and you get to help children. Click here to learn more about the Kohls Cares for Kids program. I thought it would be fun to share some lesson ideas to go with this book. So, here are some ideas, lessons, and printables to match this book!! I hope you got the great deal at Kohl's too!!! -Ask your students if they have pets? How do they know when a pet wants something. -Ask: What would it be like if animals could talk? What might a horse or chicken have to say to us? *Discuss personification: when an author makes an animal or object take on characteristics of people. -Show the students the cover of the book. Read the title. Ask the students if they think that the author will use personification in this book? What makes your students think she will use personification? Examples given may be: The title of the book: typing is not something cows do in real life. Place all the vocab. words in a pocket chart. Place the picture cards in a ziploc baggie. Have your students match the picture cards to the word. Books and Resources From Amazon.com. Click on a book to learn more! After you read the story. Share the story on VHS or DVD with your class. Cows aren't the only ones that may be able to type. What if an animal in your house could type? What would it have to say? Maybe you have a dog that you don't walk enough. What do you think that dog of yours would have to say about you? Maybe your fish thinks you should watch the animal channel instead of Cartoon Network. Maybe your cat is tired of you leaving your coat on the chair he likes to sleep on. What do you think the animals in your life would say to you? Ask your students to write letters from thier pets (if they don't have a pet, have them pretend) to themselves. What types of things might the pet be concerned with? What might the pet want to change about the household? Would the pet be happy or crabby? Silly or serious? Why? Have students draw a picture of their pet. Post the pictures and the written letters on a bulletin board entitled: "If Only Our Pets Could Talk..."
**Click Here to Print this independent activity from Teaching Heart. Have you students complete this activity after you have read the story. Awesome Products From Oriental Trading. Click on the banner to search for these items on Oriental Trading. 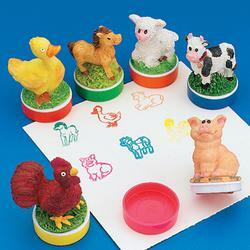 Use these RESIN FARM ANIMAL STAMPS in your writing center. Studentscan create picture stories. They can also make a pattern with the stamps. 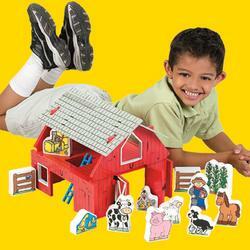 Use these BARN YARD BLOCKS with your students. They would be great for retelling the story. Ask students to discuss a time when their parents wanted them to do or wear something that they did not want to. What did they do to try to persuade their parents to change their minds? Did it work? Discuss other books you may think of or be reminded of when you read this book. Have children brainstorm situations that they felt were unfair.